My girlfriend recently went to the Local Taphouse in St. Kilda to catchup with a friend and came back with this from the bottleshop. This is quite an impressive find for my beer tastes, a Belgian style double IPA is almost the ultimate for me. So the Bitter Monk is produced at Alaska's Anchorage Brewing Company. It's quite a special beer by the sound of it, first off it's brewed with 3 types of hops before being dry hopped in the barrel. It is also triple fermented, with the second time being the crucial fermentation in French oak chardonnay barrels. 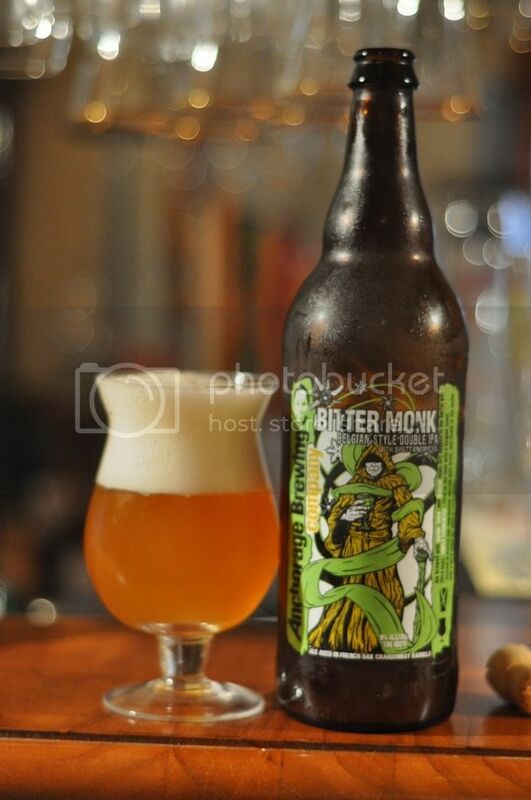 Bitter Monk pours a slightly surprising golden yellow colour, with mountains of white foamy head. The beer is quite hazy and is almost opaque, its very unusual for such a light coloured beer. The head is very impressive and lasts for quite a while before fading down to a ring around the glass. The lacing caused by this head is excellent! A beautiful looking beer, however the colour is different to any IPA I have ever seen before. This beer is definitely more vinous on the nose than any other beer I have smelt. The long fermentation in the Chardonnay barrels clearly have had an impact on the nose. I also get strong citrus and oak elements as well as a tart apple aroma, which comes and goes throughout. As the beer warms a pleasant warming smell takes hold as some caramel and alcohols come through. There is also a noticeable Brett (Brettanomyces) smell, which the brewer has encouraged. Whilst the smell was complicated, it doesn't do justice to an excellent tasting beer. It has all the characteristics of a good IPA, but with a bit of a twist! There is a grapefruit malt base topped off with some strange tropical fruit flavoured hop variety. Citrus is also very present and a moderately high carbonation helps the Chardonnay flavour take effect. The Brett compliments the dry finish and adds a bit of extra bite to this beer. The alcohol that is present on the nose is non-existent in the drinking. For what I understand to be a traditional Belgian ale, this is a really good recreation. It has fantastic bitterness, 100 IBU's, and great flavour. The French oak Chardonnay barrels were an interesting way to add flavour and something that I hadn't experienced before. Anchorage Brewing Company make some excellent beers and this is no exception, I would recommend the brewery as a whole, as this will not appeal to everyone and it's a bit expensive for my liking. Still if you like Belgian IPA's fantastic beer!